Let me tell you just one more thing that I love about being an OD -- optometry is such a small community, your classmates and colleagues are going to be constantly sharing their work (and life) experiences with you! When you get done seeing your day's patients, you may have 1 or 2 of your friends patients to discuss too via texted images. As a huge optometry nerd, yes, I enjoy this very much. Pardon the haziness, but a clear image wasn't possible. 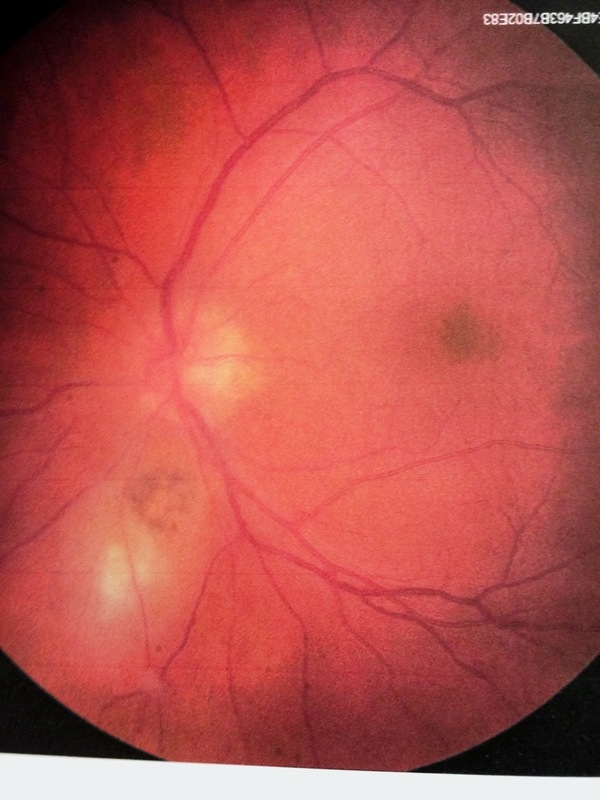 This person presented with blurry vision in one eye, and when the doctor looked inside the eye, the entire vitreous (the jelly-like substance that fills the internal eye) was cloudy and difficult to see through. This is a condition called vitritis -- an inflammation of the vitreous. The job of the doctor is to figure out why the vitreous was inflamed, so that the proper treatment could be initiated and clear vision could be restored. I am going to pause here and let optometrist and OD students wanting to play along to note one other issue in the photo besides a cloudy media. There is a white fluffy area inferior nasal to the optic nerve, and an underlying darker retinal scar that should point you to the correct diagnosis. Yes, if you guessed Toxoplasmosis, you were correct. This was confirmed by ophthalmology later (I am assuming they ran IgG, IgM and/or PCR to determine certainty). Toxoplasmosis is a parasitic infection from the protozoan Toxoplasma gondii that is most frequently passed to humans from exposure to cat feces. Have you ever been told that pregnant women shouldn't handle cat litter? Toxoplasmosis is the reason. Typically this infection is passed from exposed pregnant mothers to their fetus, resulting in the baby having the parasitic infection from birth. Often, symptoms do not arise until later in life when the parasitic infection may become "activated". This is when blurry vision often arises -- the vitreous becomes inflamed, and the retinal lesions may become active (they will look white and elevated or "fluffy" as we are prone to call them in the OD world.) "Headlights in the fog" is a classic comparison to the way the eye will look during an active toxoplasmosis infection -- the fog is the vitritis and the "headlight" is the white retinal lesion. Treatment for the active disease is typically Pyrimethamine and Sulfadiazine. The retinal lesion will leave a scar after its resolution, and these scars are a common way that latent or inactive disease is found during your regular eye exam. Just one more reason that healthy eyes with good vision can still benefit from comprehensive eye care! In other news I had another OD send me a link to a great new website: EyeAtlas. This website is just launching, and membership is open to ODs and student ODs that want to share photographs of ocular diseases to create a new electronic database for reference. I just registered today, and hope to start adding all of my personal cases whose photos I have shared on this site to their database. Please check it out, and once I get fully indoctrinated into the website, I will plan to share more information in a future post!